Through a collection of objects and actions, his works seek to escape the constraining nature of modern utopian aspirations whilst attempting to reenact them in playful, jesting objects that glorify the referent on the one hand while upstaging it on the other. Drawing on his doubt in the capacity and value of ideas, his sculptural projects seek to put them to the test by literally confronting them with the necessities of reality in assemblage that often troubles the ideas it purports to speak for. “Why is there something, rather than nothing?” is a question to be posed to art by those faced with its object: the artist, his viewers, the critics. For, in the end run there could very well be nothing. This may even be for the better. After all, if all is in the idea, as dreamed of by conceptual art, then it would be better if there be nothing in its place of origin, which is to say in the idea. Yet, we know, and one has to come to terms with this reality: there is always something, a little something, a trace, a found object, be it but the semblance of an object. The question recalls that of the philosopher Martin Heidegger, and this is not just a simple analogy: “Why is there something rather than nothing?” It is with this question that Heidegger summed up 2500 years of metaphysics. With this gesture Heidegger upheld that the essential is no longer in the answer, but in the question itself, which remains necessarily and indefinitely open. There is being, and one must make do with this, but no foundation could ever provide an explanation for it. In keeping the question open humankind is confronted with the fact that there is something rather than nothing. 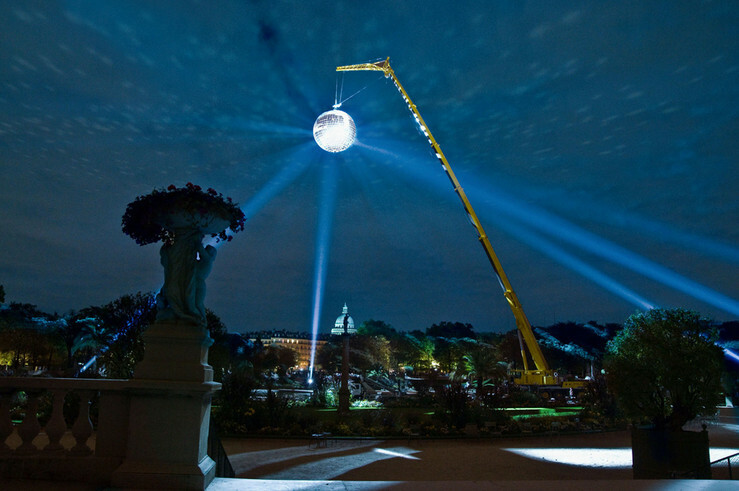 Michel de Broin is an artist that takes the ontological question in art seriously. He is a producer, a maker and creator, in the full metaphysical sense of the term — he gives material existence to the ideas that occupy him. If the project calls for it, he readily becomes a mechanic, engineer or craftsman. He has modified a 1986 Buick so that it runs on the renewable energy generated by its passengers, built a bicycle that moves by transforming physical effort into smoke, pierced a museum building with giant arrows in order to geographically identify the place of art. And yet, all these projects only take on their meaning within the discourse that accompanies them, and the concepts that frame them. So, why build these objects at all? Yet, it is all there. As absurd, and ridiculous as they may be, these objects must be there. Michel de Broin does not spare us this confrontation. So, why is there something rather than nothing? Canadian artist born in 1970 in Montréal, Canada.